NEUQUÉN, Argentina, Oct 27 2014 (IPS) - In Argentina they call it “yeil”, the hispanicised version of “shale”. But while these unconventional gas and oil reserves are seen by many as offering a means to development and a route towards energy self-sufficiency, others believe the term should fall into disuse because the global trend is towards clean, renewable sources of energy. Wearing an oil-soaked uniform, the drilling supervisor in the state oil company YPF, Claudio Rueda, feels like he is playing a part in an important story that is unfolding in southern Argentina. The first chapter of the story is being written in the Vaca Muerta shale oil and gas field in Loma Campana in the province of Neuquén, which forms part of Argentina’s southern Patagonia region, where rich unconventional reserves of gas and oil are hidden in rocky structures 2,500 to 3,000 metres below the surface. According to YPF, reserves of 802 trillion cubic feet of reserves put Argentina second in the world in shale gas deposits, after China, with 1,115 trillion cubic feet. And in shale oil reserves, Argentina is now in fourth place, with 27 billion barrels, after Russia, the United States and China. 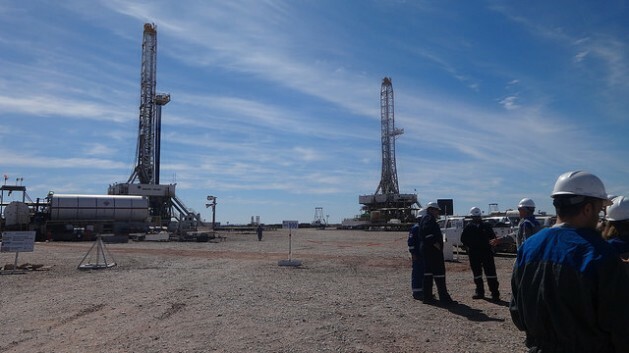 According to projections, Argentina’s conventional oil and gas reserves will run out in eight or 10 years and production is declining, so the government considers the development of Vaca Muerta, a 30,000-sq-km geological formation, strategic. “Nearly 30 percent of the country’s energy is imported, in different ways – a huge drain on the country’s hard currency reserves,” Rubén Etcheverry, coauthor of the book “Yeil, las nuevas reservas” (Yeil, the new reserves) and former Neuquén provincial energy secretary, said in an interview with IPS. “We have been in intensive therapy for the last five years, with respect to the trade balance and the energy balance,” he said in Neuquén, the provincial capital. “We went from exporting nearly five billion dollars a year in fuel, 10 years ago, to spending 15 billion dollars on imports; in other words, the balance has shifted by 20 billion dollars a year – an enormous change for any economy of this size,” Etcheverry said. Imports include electricity and liquefied gas, natural gas and other fuels. Diego Pérez Santiesteban, president of Argentina’s Chamber of Importers, said that at the start of the year, energy purchases represented 15 percent of all imports, compared to just five percent a year earlier. Since 2009, accumulated imported energy has surpassed the Central Bank’s foreign reserves of 28.4 billion dollars. Shale gas and oil are extracted by means of a process known as hydraulic fracturing or fracking, which involves pumping water, chemicals and sand at high pressure into the well, and opening and extending fractures deep under the surface in the shale rock to release the fossil fuels. But there is a growing outcry around the world against the pollution caused by fracking in the water table and other environmental impacts in wide areas around the deposits. And in Argentina many voices have also been raised against the energy mix that has been chosen. “This is an environmental point of view that goes beyond Vaca Muerta. The option that they are trying to impose in Argentina, as a solution to the energy crisis…has no future prospects,” said ecologist Silvia Leanza of the Ecosur Foundation. “We’re basing all of our economic expansion on one asset here – but how many years will it last?” she asked. Fossil fuels make up nearly 90 percent of Argentina’s energy mix. The rest is based on nuclear and hydroelectric sources, and just one percent renewable. The Intergovernmental Panel on Climate Change (IPCC) has concluded that the burning of fossil fuels to generate energy is the main cause of climate change. “This situation, along with the greater availability of renewable sources, indicates the end of the era of dirty energy sources,” Mauro Fernández, head of Greenpeace Argentina’s energy campaign, said in a report. This country’s dependence on fossil fuels has made carbon dioxide emissions per capita among the highest in the region: 4.4 tons in 2009, according to the World Bank. “Unconventional deposits look like a new frontier for doing more of the same, fueling the motor of climate change,” he complained. Argentina has set a target for at least eight percent of the country’s electricity to come from renewable sources by 2016. “Staking our bets on fracking means reinforcing the current energy mix based on fossil fuels, and as a result, it spells out a major setback in terms of alternative scenarios or the transition to clean, renewable energy sources,” said sociologist Maristella Svampa, an independent researcher with the National Scientific and Technical Research Council. “In the last decade, fracking has certainly transformed the energy outlook in the United States, making it less dependent on imports. But it has also made it the place where the real impacts can be seen: pollution of groundwater, damage to the health of people and animals, earthquakes, greater emissions of methane gas, among others,” she said. “We finish extracting everything in the Neuquén basin and what do we have left?” she commented to IPS. Etcheverry mentioned the possibility of using solar energy in the north, wind energy in Patagonia and along the Atlantic shoreline, geothermic energy in the Andes, and tidal and wave energy along the coast. But the author said that for now the costs were “much higher” than those of fossil fuels, because of technological reasons, transportation aspects and energy intensity. He also said oil and gas are still necessary as energy sources and raw materials for everyday products. For that reason, Etcheverry said, the transition from the fossil fuels era “is not simple.” First it is necessary to improve energy savings and efficiency, in order to later shift to less polluting fossil fuels, he added. “In the first stage it would be a question of moving from the most polluting fossil fuels like coal and oil towards others that are less polluting, like natural gas. And from there, creating incentives for everything that has to do with clean or renewable energies,” he said.